A hearty salute goes out to all who have volunteered to take part in the Grand Island City Wide Clean-up planned for the weeks leading up to the Nebraska State Fair. Clean Community System will host an Electronics Recycling Day on Saturday April 23, 2016 in conjunction with the Keep America Beautiful Great American Cleanup. The agency has also recieved grants to continue operating it’s Household Hazardous Waste facility. To view the full article please visit The Grand Island Independent. AURORA HOUSEHOLD HAZARDOUS WASTE COLLECTION A SUCCESS. Thousands of pounds of Household Hazardous Waste was collected on Saturday, April 16th in Aurora, NE. 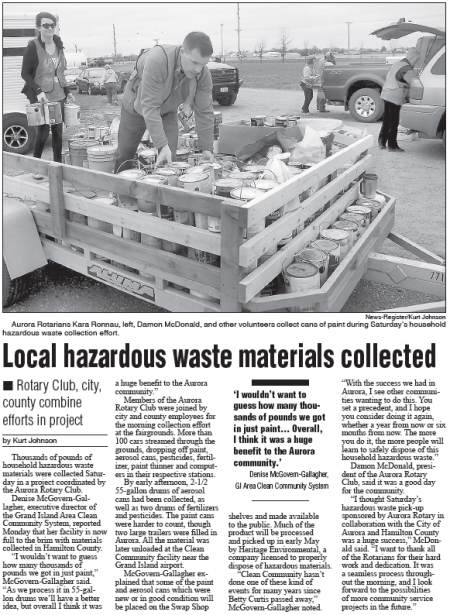 The Aurora Rotary Club sponsored a Household Hazardous Waste collection event for Aurora & Hamilton County residents to properly dispose of their paints, aerosols, fertilizers and more. For more details, visit the Aurora News-Register. Grand Island Area Clean Community System announced today that it will receive $158,900 from the Nebraska Environmental Trust for the “Household Hazardous Waste Collection Facility” project. The Trust Board announced funding for the project at its meeting on April 7, 2016 in Lincoln, This is the first year of award with a potential for 2nd and 3rd year funding totaling $160,700 and $163,900 respectively. Clean Community System will also receive $55,000 from the trust to finalize the third year of funding from its grant application back in 2014. These projects are two of the 118 projects receiving $18,799,900 in grant awards from the Nebraska Environmental Trust this year. Of these, 69 were new applications and 49 are carry-over projects. The Nebraska Legislature created Nebraska Environmental Trust in 1992. Using revenue from the Nebraska Lottery, the Trust has provided over $250 million in grants to more than 1,900 projects across the state. Anyone – citizens, organizations, communities, farmers and businesses – can apply for funding to protect habitat, improve water quality and establish recycling programs in Nebraska. The Nebraska Environmental Trust works to preserve, protect and restore our natural resources for future generations. Grand Island Area Clean Community System would like to thank Boy Scout Troops 1 and 7 for spending all day Saturday, April 9, picking up litter along Highway 281 from Old Potash to Capital Avenue. The Boy Scouts and adult volunteers picked up 160 bags of litter along the two-mile stretch. We would like to extend an invitation to motorists and businesses along Highway 281, Diers Avenue and Allen Drive to respect and continue the Boy Scouts’ hard work of keeping this section of Highway 281 clean and litter free. For the full Letter to the Editor, visit The Grand Island Independent.